How much time do you spend online? For most of us, it’s a lot. We read, post, tweet, watch and interact like never before and have access to a whole world of information at our fingertips. Because of this, it’s more important than ever before to watch the messages we absorb and then put back out to the world. How often have you clicked on a news articles just to read the comment war? How often has it left you feeling angry, demoralised or spewing you feelings out to the world in the comments section yourself? I know I’ve done it- typed out a long, thought out response to a news topic or comment thread, believing my careful words would make the world a better place. It doesn’t, of course. The next comment is often a crude insult or loud opposition and the world keeps turning. I don’t read comments these days, especially on topics like asylum seekers, global warming, the homeless, weight and body image, parenting or… well, anything except adorable pug dog videos. It’s too depressing to read such negative words and horrible slurs bandied between strangers, about strangers. If you feel like social media or other internet or media sources make you feel angry, frustrated, depressed or are lowering your self-esteem you need to change it. Here are some tips that may help you to have a more positive online experience. Whether it’s too many photoshopped celebrities, out of control flame wars or just a deafening abundance of ‘positive’ memes that make you feel anything but, you can change what you see. Start by going through the pages and people you ‘like’ or ‘follow’ on social media platforms. Do they genuinely add to your experience? Do you feel uplifted or dragged down when their name pops up in your feed? Get rid of any that do the latter. If you need to, you can ‘hide’ the Facebook feed of friends if you want to stay connected but don’t want to read what they share. Make sure you have diversity, too. Seek out people that love what you do- Rockabilly fashion, sci-fi books, amazing gardens, math jokes and cute kitties. Look for things that will educate and inspire you. It will take some tweaking as you may find some sources more controversial than you realised and others may be not what you thought, so make it a constant quest to fill your screen with things that make you feel happy, empowered or educated. Don’t stop at the internet- magazine, TV and radio can all give you similar feelings. Swap your trashy tabloid for a social consciousness magazine and swap reality TV for a great documentary. Be aware of what you like, share, retweet or post on social media. Choose your words carefully and ask yourself if you’re putting out positive vibes, or feeding the negative ones. Don’t put yourself down and don’t criticize others. Don’t engage in heated debates unless you’re sure you can keep a cool head and stick to your message, without getting upset or making it personal. That’s not to say that you shouldn’t share if you’re having a bad day, just try to make sure that on balance, you’re being uplifting and positive. If you feel like to need some support try calling someone and talking to them in person. It will more than likely get you a much better result than relying on social media. Above all, remember what this virtual world is all about. It’s a false depiction of a world that is bright and warm. It might have its problems but it has a lot of good things and you can’t experience those from behind a keyboard. Go for a walk, throw a ball, make a snow angel or build a sandcastle. Read a book. Sleep in a tent. Get away from your screens and make a devoted attempt to disconnect every single day. 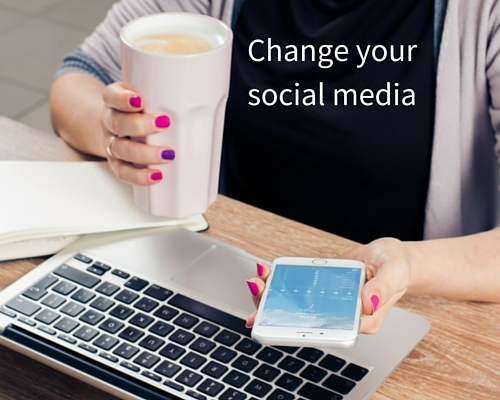 Have you taken any steps to control your social media?